Update: The Behemoth has also now teased a PS4 version to be announced on Tuesday. Curiously, Castle Crashers Remastered never landed on PlayStation 4 when the Xbox One version was released. It seems The Behemoth now seeks to remedy that. It seems like, with all the indie success the Switch is seeing these days, it makes sense for indie developers to try and get their games onto the system for a piece of that pie. If your game is multiplayer, so much the better, because the marketing copy basically writes itself at that point. This is probably the logic behind The Behemoth, developers of games like Alien Hominid and Battleblock Theater, to start teasing a Switch release of their side-scrolling beat ’em up Castle Crashers. The tease came in the form of a tweet showing four joycons in the colors of the four default Castle Crasher playable knights. When users mentioned that they are missing pink and purple, The Behemoth tweeted those colors out, too. 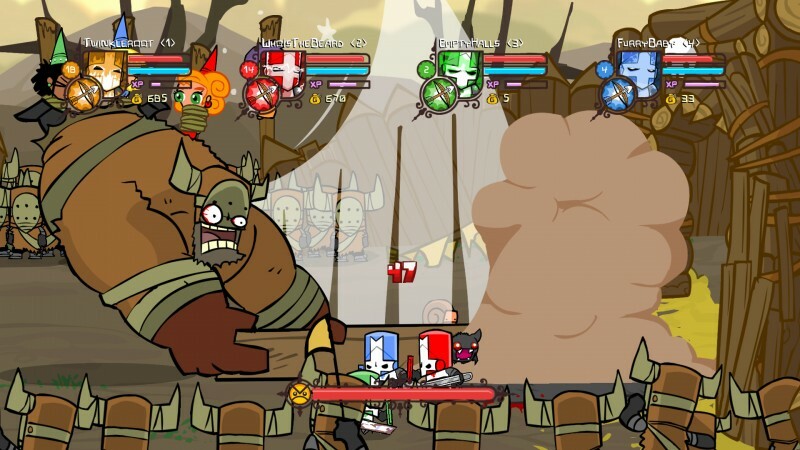 Castle Crashers was originally released on the Xbox 360 in 2008 as one of the crown jewels of the still fairly nascent Xbox Live Arcade service. Castle Crashers Remastered, which boasted a lot of technical improvements and marginal new content, released on the Xbox One and as a Steam update in 2015. The Switch version would presumably be the Remastered one, but you never know.